Simply enter your email address to grab the free Future House Live Pack! 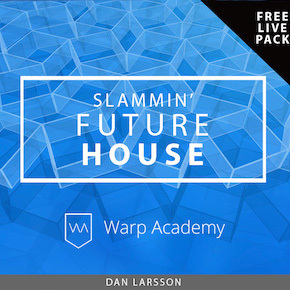 We’re giving away one of the Slammin’ Future House Live Packs for free! Over the past couple of weeks you’ve probably seen the launch of the epic new Future House Live Packs and Operator presets from Dan Larsson. I’ve you’ve been thinking about picking it up and getting deeper into this emerging genre, and upping your Operator skills, check out this free Pack. It’s a complete, fully-functional Ableton Live Set that contains a bunch of deadly Operator presets, Racks and effects chains that you can use in your own music and add to your Library. If you’re curious about what’s included in Slammin’ Future House, or just hadn’t pulled the trigger yet, then grab this free download and fire it up! Dan also recently put together a full walkthrough video showcasing how the Pack was built. The video covers the free template we’re giving away so definitely check it out below.